Wambui Njuguna-Räisänen has been an Ashtanga yoga teacher and practitioner for nearly a decade and was authorized to teach the Primary Series by R. Sharath Jois in 2016. She began teaching Ashtanga yoga in 2011 at the Ashtanga Yoga School of Helsinki and leads regular workshops in Finland and Sweden. 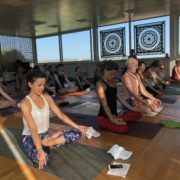 In addition, she co-teaches on workshops and retreats with senior Ashtanga yoga teacher, Petri Räisänen, who is also her husband. 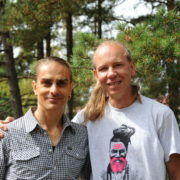 Together, Petri and Wambui approach the practice of Ashtanga yoga from a gently healing, inclusive and therapeutic perspective. Wambui edited the English version of Ashtanga Yoga: The Yoga Tradition of Sri. K Pattabhi Jois and translated (Finnish-English) Nadi Sodhana: Yoga in the Tradition of Sri. K. Pattabhi Jois. Many people start practicing Ashtanga yoga using her Half-Primary series You Tube video, which has garnered more than 1.1 million views. Wambui was born in Nairobi, Kenya to an English-Danish mother and a Kenyan (Kikuyu) father. She was raised in the United States, has worked and lived in Chile and the United Arab Emirates and is now based in Helsinki, Finland where she lives with Petri and their two sons. 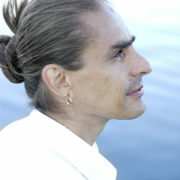 In addition to teaching Ashtanga yoga, Wambui also gives Chavutti Thirumal massage (by foot press) treatments, both in Helsinki and internationally, and applies aspects of energy healing and traditional Finnish bone-setting techniques into her treatments. She has also assisted her teacher, Helen Noakes, on massage trainings. Wambui is also a Yin Yoga practitioner and regularly guides meditation and chanting sessions on yoga retreats. She speaks grammatically creative Finnish, decent yet underutilized Spanish, and a few random phrases in Kiswahili and Kikuyu. When not practicing and advocating for honest self-care, Wambui is at home (and on the road) with her family, practicing the seventh series! She believes in travel as a wonderful way to keep her children’s worldview open, before setting roots down to write more, grow sunflowers and plant a lemon grove.